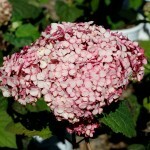 A summer blooming shrub with huge blush-pink flowers that change to deep pink and finally mature to chartreuse green. The flowers are held on sturdy stems. It prefers full sun and a well-drained soil. They bloom on new wood. 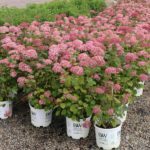 Use in the border, for mass plantings, or a focal point in the garden.